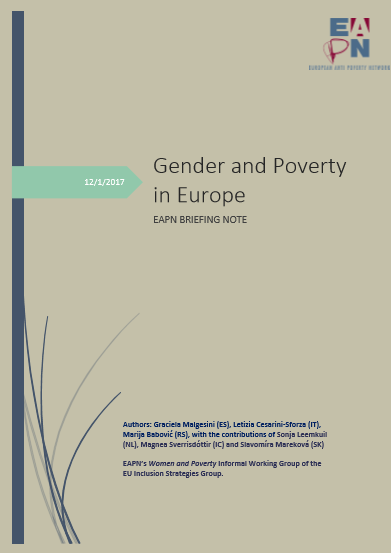 8 March 2018: On the occasion of International Women’s Day, EAPN presented its new briefing: Gender and Poverty in Europe. Both poverty and gender inequality are two forms of social injustice. They undermine human rights; the, wellbeing of individuals, and their capacity to develop their full potential in life (as emphasized in the human development approach). Despite efforts made to make progress in gender equality, women are still in an underprivileged position in our societies, and therefore at higher risk of poverty. Women experiencing poverty are exposed to twofold risk and injustice – based on gender and based on their poverty status. Monitoring gendered aspects of poverty is necessary to understand the gender-specific forms and causes of poverty and – in accordance with this – to advocate for appropriate policies and measures that can eliminate or prevent them. According to the Gender Equality Index for 2017, gender inequalities are still prominent and compared with the situation ten years ago there is very little progress in achieving gender equality. This report outlines what the causes of higher risks of poverty among women are; what gender discrimination is, and what the EU has been doing to address poverty from a gender perspective, as well as offering testimonies, good practices, and offering recommendations for changes that EU, national & local government, insititutions & companies, and education should make. The briefing was publicized at a media conference during an EAPN meeting taking place in Belgrade (Serbia), co-organised by EAPN Serbia, SeConS & UN Women. “Poverty means many things. Women have to deal with things on their own, especially if they are Roma like me. To people experiencing poverty and discrimination: follow yourself; make your own path. Education is the most important thing, even if poverty sometimes prevents children and girls from having a good quality education.” said Milica Petrovic, a woman with direct experience of poverty from Serbia.